The flat white is the new kid on the block when it comes to coffee. 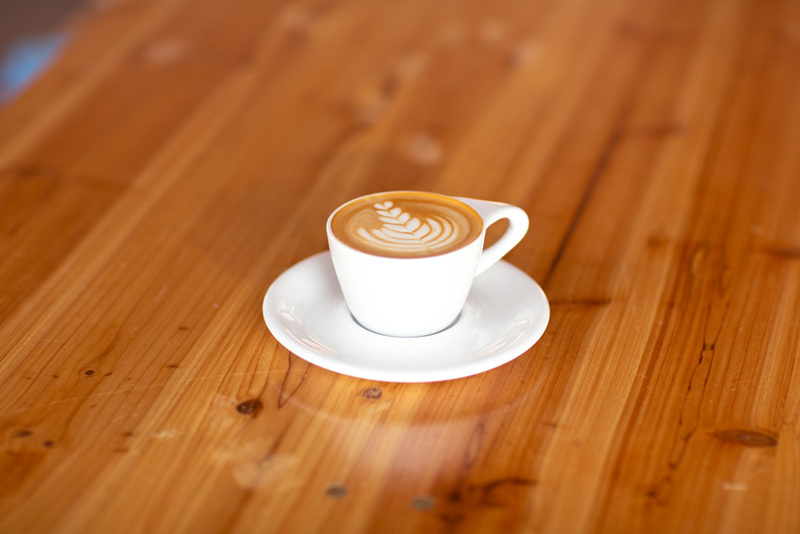 Originating from Australia or New Zealand, depending on who you talk to, it is now filling menus in coffee shops around the world – but what makes a flat white a flat white?! The flat white coffee is an espresso-based coffee drink accompanied with steamed milk and microfoam. This microfoam is made up of steamed milk which is gently infused with air. This results in silky, textured milk containing tiny air bubbles. Air bubbles should be barely visible to the coffee drinker when perfectly made. It traditionally comes in a small size only (5oz-6oz), much smaller than typical cappuccinos and lattes. The flat white served in large-scale chain coffee shops is usually deemed to be non-traditional as its size can sometimes be around 10oz. Here, the traditional coffee to milk ratio is altered drastically which dilutes the richness of the drink. Much like diluting with hot or cold water, espresso coffee’s flavours can be diluted by milk, either hot or cold. As the concentrated espresso is diluted more and more, its famed body, texture and intense flavours becomes less and less obvious to the coffee drinker, as milk flavours will crowd it out somewhat. The espresso should be present as a higher concentration of the overall drink, so coffee flavours are more prominent over the milk’s sweetness. Baristas also should add only a thin layer of foam onto a flat white to prevent any distraction due to different textures. The artistry that goes into producing an excellent espresso can often be under appreciated here due to the focus on milk – the key to a successful flat white coffee lies in the ability to create both quality microfoam and a well balanced espresso shot, simultaneously. This means being able to steam the milk to create consistently tiny bubbles throughout, while not losing sight of your espresso’s recipe. If done well, the flat white can be absolutely delicious and a great way of showcasing the intrinsic flavour of a coffee in a milk based drink. For more information about how you can put your skills to the test, or how you may be able to acquire these skills yourself, drop me a line to enquire about some of the courses we run through our Coffee Academy! Although the flat white, latte and cappuccino are all milk based, when prepared and served properly they are very different drinks. All three are combined with double shots of espresso in their traditional serving style, which we now see being anywhere from 30-60ml in size. The size of an espresso often changes. This may be according to country or region, but could be down to a coffee shop (or barista’s) preferences in roast degree or espresso recipes. With more education about espresso in circulation, an espresso recipe can now be seen to change according to a place’s water composition, or specific equipment being used. Putting espresso aside, let’s start with a look into the composition of a latte, one of the most common drinks served in UK cafes. A latte is milky overall, both in flavour and in its ratio of coffee to milk. Variations in size are common, but in UK speciality coffee shops we see the range 8-12oz most often as a ‘regular’ size. Please note that the style and type of coffee used is often a dictating factor in overall drink sizes offered. Generally speaking, the proportions of a traditional latte take the ratio 1:4:1 (1 part espresso to 4 parts milk to 1 parts foam). Drink size and depth of foam may vary, again according to a particular shop or barista’s style and preferences, but usually foam sits anywhere from 0.5-1cm in the cup. Foam depth and the espresso’s size generally don’t change with the drink’s size; usually only the volume of liquid milk alters. Moving onto the cappuccino, we see a substantial difference in composition. Again, recipes vary according to the factors described above, but the traditional cappuccino has a very thick foam topping (around 1cm of depth in the cup). Overall size is a key variance seen in cappuccinos, but now it is also common to reduce the thickness of foam. This is normally done to allow baristas to pour latte art. Occasionally too the cappuccino is offered with chocolate or cinnamon as optional dustings to suit a wider range of preferences. The standard size of a cappuccino tends to be smaller than a latte, but larger than a given shop’s flat white, which we see commonly at 6 or 8oz, though this does inevitably fluctuate given the differences mentioned previously, as with all coffee beverages. The drink’s traditional ratio of espresso to milk to foam sits at 1:3:2, but it can be found (in the UK at least) that milk foam occupies a slightly smaller part of this in a lot of modern cappuccinos. The deeper foam in a cappuccino is an interesting thing, as it almost hides the coffee liquid below it. The liquid beverage below the foam can be strong in coffee flavour. The flat white uses a much smaller ratio of espresso to milk so the taste of espresso is much more dominant in the overall coffee. The milk is also more evenly blended throughout the drink so the combination of espresso and milk is more consistent throughout the entire drink. Flat whites and lattes are commonly served by specialty coffee houses with latte art on top of the beverages. To enable accurate, finely detailed free-pouring of latte art designs, milk for lattes and flat whites must inherently be more of a homogenous, silky texture not dissimilar to white paint. The cappuccino would require more air being incorporated into the milk, resulting in a greater volume of foam. Finally, looking into a flat white recipe in more depth, the specification is a silky, thin textured milk (up to 0.5cm in depth in a 5-6oz cup) on top of a double shot of espresso, which in itself can be quite large with modern serving styles, sometimes even up to 60g in weight. The rest of the drink is made up of the steamed liquid milk created with the aid of a steam wand. Overall, the recipe is extremely flexible as you’ll find it in cafes across the UK, largely due to the style of coffee served by coffee shops specialising in great speciality coffee. Each coffee they use – which may differ according to seasonality and roasting style – will likely have a different espresso recipe, which will (as you can glean from the overall small size of a flat white at 5-6oz) ultimately change the balance of flavour with each different coffee used in the grinder. Generally speaking though you’ll find a 2-3oz espresso shot topped with steamed milk, and the signature being the silky texture of this milk, and likely a little latte art too. For a visual indicator of what this might look like, see below!